How risky is flying through turbulence? They are risky in that, should you decide to unbuckle your seatbelt, you might get thrown and hit your head or otherwise injure yourself. 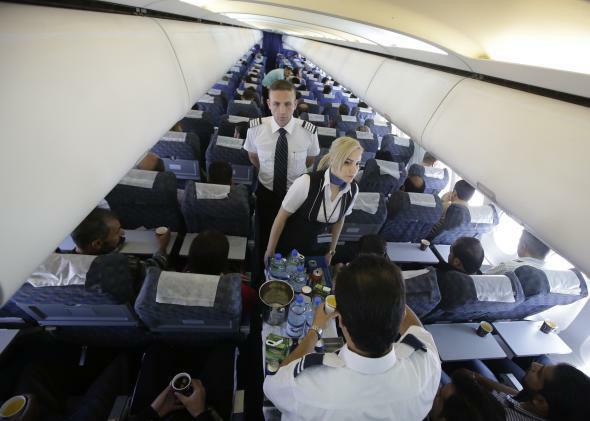 There are hundreds of flight attendants who get injured every year due to turbulence-related incidents. You have to remember the airplane seatbelt is not there for crashes but to keep you in your seat. They started putting them in in the days of open cockpit biplanes: When you inverted the aircraft, you could fall out of it! There is almost no turbulence that any pilot would willingly fly through that would cause structural damage to an airliner. Sure, heavy thunderstorms, but there’s no way I’m flying through that purple blob on my radar. Captain Silski is right on target, especially about the flight-attendant injuries. They’re often required by their job to be exposed when passengers have no business being out of their seat or even unbuckled. They’re at risk—not always willingly—to make passengers’ flights a little more comfortable, so please stay out of their way and let them do their work and get seated themselves. It seems like every flight I take these days there’s some idiot hopping out of his or her seat with the seat belt sign illuminated, getting stuff out of the overhead, going to the bathroom, or whatever. Turbulence will result in that passenger or his stuff being thrown on me, and I don’t appreciate that. Will the upcoming A350 be a game changer? Is flying in a private, single-engined airplane or a helicopter more dangerous than flying in a commercial airliner? As of March 2014, what’s the safety record of the Boeing 777?